The Birmingham Small Arms Company (BSA) was for most of it's life Britain's largest motorcycle manufacturer. After World War 2 it became the largest in the world, producing over 75,000 bikes a year in some years of the 1950s. BSA did well in post war economy and was involved in producing guns, taxi-cabs and metal plate. The company began in 1854 as a joint venture of a number of small Birmingham, England area gunsmiths to supply armaments to the British forces during the Crimean War. The progression to build bicycles came in the 1880's as a result of a decreased demand for firearms. BSA's motorcycle business started in 1903 building re-enforced frames to hold an imported 2hp engine. The first BSA to roll off the line with all of its parts produced in-house was a 498cc side valve engine in 1910. During World War 1, BSA supplied some motorcycles to the war effort but concentrated most of its attention to making armaments for the allied forces. BSA had a relatively strong racing presence prior to the Second World War. All racing activity was put aside during the War but resumed afterwards to give the company consistent racing results which had eluded them beforehand. Racing success equals strong consumer sales and the motorcycles were considered very reliable and a good value for the money. In the late 1930`s they purchased Sunbeam. In 1944, they purchased Ariel. 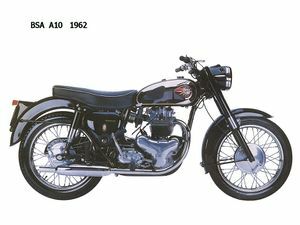 BSA went on to purchase Triumph, which eventually merged with Norton - Villiers. This page was last edited on 20 January 2011, at 21:02.